Whether you want to prevent new heels from pinching you or hiking boots from roughing up your feet, eNZees is 100% natural wool for blister relief. Where does this wonder wool come from? The lambs of New Zealand. Their wool is coated with lanolin—a wax that sheds excess wetness and keeps them dry. The lanolin works just as well for you, wicking away moisture and reducing the friction that causes blisters and hotspots. To use eNZees, tear off a piece of wool and place it on your trouble spot. Keep it in place while you put on your sock or shoe. It provides a comfy cushion and, if you are wearing socks, will even weave itself snugly into the fibers. The wool is humanely sourced in the spring, just in time to trim up the lambs’ coats so they’re less prone to summer heat strokes and unwanted insects. Maker Jill Schuman was first exposed to this age-old remedy before a 27-mile trek up the New Zealand mountains. But eNZees is good for any blister-prone activity, from dancing to commuting. This pain-stopping wool is as kind to the lambs as it is to your feet. Hello Grommet Fans! 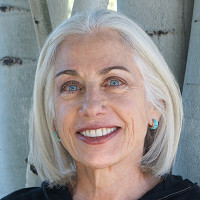 I’m Jill Schuman, Founder of eNZees Foot Soother. I am so excited that the Grommet is launching eNZees Foot Soother today. I have traveled the world, hiking and walking thousands of miles in the process. 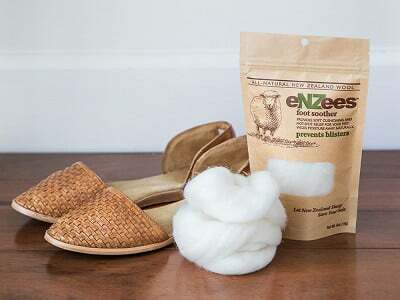 I have never experienced such effective and total protection from hot spots and blisters as I found with New Zealand lambs wool and I have made it my mission to bring this great product to the U.S. eNZee's Foot Soother's soft lambswool and natural lanolin will make all your footwear as comfy as your bedroom slippers. 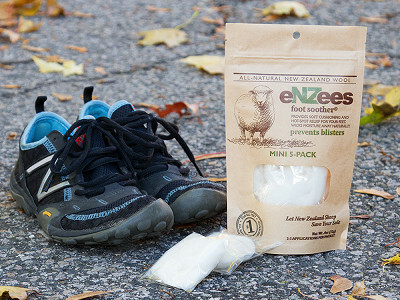 eNZees is a natural fit for hikers and runners who are more prone to blisters, but people get blisters in many different ways. What other uses has your audience found eNZees successful with and what has been the feedback? MIke I am so glad you asked. We have gotten terrific feedback from urban users, who use eNZees Foot Soother in their work and dress footwear for comfort and blister prevention when walking the city streets and dancing in the latest fashionable footwear and throughout their work day...MDs, nurses, waitresses, amazing feedback. I have heard from bikers who use it in their bike shorts to prevent the pesky rash that many get and can't get rid of. I personally use it in in my ski boots, and slip on shoes to keep my feet dry. A friend reported using eNZees on a long ago broken toe, she wraps it around the adjacent toe for comfort and does "not leave home without it". I get numerous new uses all the time; the lanolin is so curative that I can go on with what and where folks are using eNZees Foot Soother. It's like magic. I hope you enjoy! Jill - This product looks great. Seems like it will be fantastic for my kids in their ski boots! Also- they are starting tap lessons again this fall and sometimes need something on their heels. Thanks for a cool product. Thank you for bringing this product to the US! I have tried every variety of blister prevention products out there and none has worked as well as yours. Not only do I not get blisters in my usual spots when I use eNZees, I get the added bonus of soft skin from the lanolin. I love this product! @Jill Thanks Petra Happy Trails! Would this work for hammer toes? Trying to find something to protect my toes from rubbing on shoes that are a bit skimpy for the summer is difficult. Chad from the Customer Experience Team here. What keeps the wool in place? Is there any sort of adhesive required when using the product? @Chad Thanks Chad, been waiting for someone to ask that question. The natural crimping of the wool, like hair, weaves into the sock like velcro and keeps the wool in place until you tug at it to remove before washing your sock No scissors, tape, bottles, or anything more is needed. @Jill I will add to this as besides using eNZees in my biking shoes, I use them at times inside my biking shorts to alleviate chaffing on long rides. I use the bulk pack and place a piece of wool on my skin and it adheres to the shorts and stays put with no sticky adhesive or clips. You do not even know they are in place. The eNZees work magic as tender spots feel better after the ride from the lanolin treatment they received during the ride. This is truly a product that leaves a potential problem area better than it found it while allowing the user to enjoy what ever event or activity it is they set out to do without the annoyance or discomfort that one might anticipate. The key is to get the eNZees in place at the first twinge of discomfort. @Jill What if you're not wearing socks? @Jill I will add that besides using eNZees in my biking shoes at the first hint of a hot spot, I purchase the bulk pack and use a piece of wool inside my bike shorts to prevent chafing. Simply put a piece next to your sensitive area and not only is it protected but leaves the area feeling better after the ride than it felt before. That lanolin does wonders. The best part is no sticky tape or strips or clips to hold it in place. The eNZee stays in place by adhering to the fabric exactly where you place it. After the ride just take it out and reuse. If you have ever had any activity or event ruined or hampered by a hot spot or chafing this product will change that. It truly works and feels like nothing at all on your body or in your shoes or clothing. Thanks for the insight, Dave. I think we have found 50 extra uses since the start of the day. I am thrilled that FINALLY eNZees Foot Soother is available and being promoted on such a broad level, here on The Grommet! The world needs to know about this fabulous product! I have been a devoted user for nearly two years and have had to buy directly from the manufacturer, off of the product's website. Now you know- so don’t hesitate and buy a package (or two) today! This natural sheep’s wool is a lifesaver, obviously for a variety of issues facing athletes but it has really come to the rescue for me while dancing the night away (I’m talking about your strappy, cute, but much-too-painful-to-wear sandals that in stored in the corner of your closet!) and even during a long day at the office, on your feet in 3 inch pumps. Not only soothing to your feet but many practical other uses, from chafing clothes, to cushion a medical cast or prosthetic. My 2 year old granddaughter currently wears therapeutic ankle braces and her mom cushions them with the fluffy eNZees wool so they are comfortable for her to wear without fussing. This is one of those “where have you been all my life” products and I urge you to purchase some now and then you will be able to rave, like I do! @Jill the suggestion to use this product in bike shorts is an interesting one. As a spinner, I have wool roving. Is your product decidedly different than that? I used eNZees while trekking in New Zealand last year. In 1,800 miles I didn't get a single blister!!! This stuff is amazing! That's awesome, Margaret! I have to ask...was it the road to Mordor from Lord of the Rings...? @Mike We did go through Mordor, AKA the Tongariro Alpine Crossing, an active volcanic region! I am immensely jealous. That sounds so cool. If only Frodo and Sam had eNZees. Though I guess barefooted might have posed difficulty. @Becki eNZees is a specialized lambswool and have spent over 1.5 yr developing the exact wool for this use. So not sure what you have and how it was developed. We use New Zealand wool specifically for the uni the static climate conditions in NZ. My toes get really sweaty when I get nervous. Would eNZees help if I wove it between my toes? Is it washable for reuse? I am a 91 year old great grandmother. My main foot problem is that I have hammer toes on my right foot. Most of the shoe boxes on closed toe shoes are not high enough causing painful blisters. Wen I used eNZees for the first time I was amazed, when I removed the shoes there wasn't ev'en a red mark and shoes were so comfortable I could keep walking. @Mim You made me smile..might have to use that tag line! Glad to know that eNZees gave your toes some relief. 91 yrs old...wow...I must tell my grandmother about you. Might this work to line an irritating bra band? This has been revolutionary for me. I have had two foot surgeries and eNZees has enabled me to hike pain free. Right after brushing my teeth each day, I wrap my toes up and they are warm, cozy and enable me to go through my day with smiling feet. @carol That makes me happy to hear that you are able to get on the trails. I have to admit that it took an experience as powerful as that for me to start another business. I believe that this simple solution is hard for people to get their minds around. But all the comments above including yours are examples of all the uses. Don't forget the discarded wool can go into your garden to nourish the earth. Thank you for taking the time to let us know. I'm so psyched more people will have the opportunity to use it too! @Jill This product came highly recommended to me by my sister. I started using it in cold NH winter walks and found it kept my feet toasty warm and relieved the irritation on my bunion. I continued using it into the spring and summer in my shoes when I always go without socks. I no longer get those little blisters on the tips of my toes from rubbing. It has become part of my daily routine to place a piece of eNZees into my footware. My feet are happy. This is one heck of a testimonial, Mindy, thank you! Great product.. I have trekked all over the world and hate breaking in new hiking boots like I did this weekend. Enzees saved me!! Simply put them on foot added my sock ... on the hot spot between tongue and my ankle - now they are "broken" in and I don't have to buy new ones!! Thanks for bringing to Colorado Rockies. Now everyone can follow in your footsteps, Elaine, thanks for the feedback!